Quality met commitment in this opening round Bundesliga tie between two of the division’s minnows, as Augsburg twice fought back through their new hero Sascha Mölders to earn a point from the kind of game they know that they could not afford to lose if they are to have any chance of staying up this season. After a chance-free first half which saw Papiss Cissé offer nothing, the Senegalese showed one moment of quality early into the second half to open the game up. But despite Augsburg using their wingers a little more and the long ball a lot less in the second half, Freiburg tried to play more football over the course of the 90 minutes, so you could make a case for them having been good value for a win. However, thanks to Augsburg’s players and fans showing the same level of energy from the first minute through to the last, and some inspired substitutions by coach Jos Luhukay, the top-flight newbies fought back in the final ten minutes to salvage a draw. The SGL arena (sic) erupted as the hosts kicked off; Augsburg were at last starting life as the 51st team to compete in the Bundesliga. They held the ball well early on, although Freiburg sat off by and large in a disciplined 4-1-4-1. But after a while, Heiko Butscher was drawn out by Mölders, who drew a shove from the centre-back as he chest-trapped a long pass from the defence. The free-kick was floated in to Uwe Möhrle, but he headed straight at Oliver Baumann. Mölders had a very busy opening five minutes as his side bossed the ball; the new signing from FSV Frankfurt leading the line with energy, and drawing lunges. But despite being dictated to by the ball-hogging and enthusiastic home side, Freiburg didn’t find it too difficult to get at Augsburg down either of the channels, drawing a number of free-kicks and gaining territory sporadically. Added to that, the away side gradually reduced the home side’s tempo, although they did find their short restarts well guarded by Augsburg. Lorenzo Davids, up and down constantly in the opening ten minutes, joined Mölders and Daniel Baier in pressing high in a narrow, three-pronged wall, the aim being to stop Julian Schuster feeding the five men in front of him. This meant that Markus Sorg’s side soon began to bypass their main playmaker, passing straight to Johannes Flum or Cedric Makiadi instead. Although both were sprinted after by man-marking defensive midfielders or centre-backs (which player did the job depended on what zone the man going for the pass was in), Freiburg soon found that by making some decoy runs, there was space to be found between the three Augsburg players pressing highest and those deep defenders who hadn’t followed a Freiburg man out. However, save for winning a few corners, Freiburg made little of their gradual monopolization of possession between the fifth and 15th minutes. Cissé, as is his style, soon began to do the one-man, high octane pressing job for Freiburg whenever Augsburg started short (a tactic they were fond of, as this allowed them to feed a full-back who would always then scoop the ball upfield for one of the roving attackers – both of whom were winning a number of fouls with their tricky darts). In terms of receiving or using the ball, however, the striker who last year bagged 22 goals for Freiburg was not quite as busy as his Augsburg counterparts at the other end of the pitch. Mölders was still doing a great job in generating space for Baier and the wingers, but the subsequent quality of balls into the box was poor, keeping the score at 0-0 as we passed the 20 minute mark. But, because Augsburg were doing a decent job with their direct tactics, Freiburg soon began pressing with more players higher up the pitch. 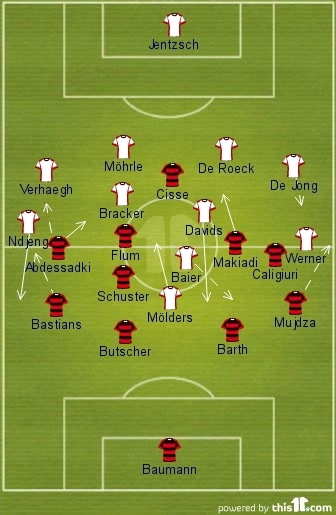 If this tactic didn’t succeed in cutting off the pass to the full-back, then its back-up plan was that it made the Augsburg strikers drop deeper, forcing the home side to play shorter passes which, given their collective paucity of technique, was something they struggled to achieve. Nevertheless, Freiburg were hardly threatening a goal themselves, something they in part brought on themselves. By being so determined to take the sting out of the game, they forced Luhukay into a tactical reshuffle. Now, he sat his side off-ball in a narrow and compact 4-2-3-1. Thus, Freiburg found it difficult to either risk flying their full-backs forward or make the same passes into that previously huge Augsburg defence and midfield corridor. Although Freiburg did on several occasions get into the final-third, aided usually by their players looking more comfortable performing swift and short passing moves, these were soon broken down given the intensity of the Augsburg pressing and the little space available. But because the hosts lacked counter attacking pace – when reaching the final-third – or the ability to make a decent final ball, a stalemate was beginning to ensue. So a goal, if one was going to come, was always likely to be courtesy of a set-piece (and helpfully, Freiburg had given away ten free-kicks in the opening 28 minutes). But when on the half-hour Marcel de Jong – who was always on hand to shoot with any second ball from a cleared corner-kick, irrespective of the fact that he was usually 40 yards out – curled in a left-footed free-kick from the right which no one in red and black took charge of, Mölders would have put Augsburg ahead had he not bicycle-kicked thin air in the six-yard box. In the 35th minute, Freiburg tried giving Luhukay’s side a taste of their own medicine. Baumann started short, the centre-backs passed to Felix Bastians, still in his own half, and as the away side’s wingers veered and darted infield, the left-back scooped the ball towards the D. Möhrle stormed out and flattened Caligiuri, but after the right-sided midfielder had dusted himself down, Schuster curled the free-kick straight into the wall. As we entered the final five minutes of the half, Augsburg began to lose their tactical discipline again – pressing high with Davids helping to form a 4-1 that shackled Schuster and chased the man on the ball furiously whenever he came to within ten yards of crossing the halfway line. With Jan-Ingwer Callsen-Bracker thus isolated in front of a defence which had dropped deeper again given the increased infield running of Yacine Abdessadki in particular, there was space for the likes of Flum and Makiadi to take the ball in again. However, Cissé was strangely lifeless whenever his colleagues had possession in the first half, and with the Freiburg midfield unable to establish any sort of link with their talismanic line-leader, a number of cute passing moves attempted by the visitors fizzled out (always under relentless Augsburg defensive pressure, of course). However, in the 42nd minute, Makiadi showed that he wasn’t willing to let the first 45 minutes peter out with nothing further to report. The Congolese midfielder darted out to the left flank, dragging Möhrle out with him. Faced with a one on one duel, Makiadi did a few stepovers, before nutmegging the centre-back and firing a shot towards the inside of the near post. Luckily for the hosts, Simon Jentzsch had his angles covered, and the teams went in scoreless at the break. The formations in the 80th minute, with Freiburg 2-1 ahead. Luhukay was the only manager to have made a change as referee Jochen Drees got the second half under way, Axel Bellinghausen replacing Tobias Werner in a like for like switch on the left wing. But just two minutes into the second half, Cissé showed why he’s worth keeping on the pitch even when he’s contributed next to nothing. Felix Bastians punted the ball upfield, and after Paul Verhaegh misjudged the flight of the hoof, the Sengalese striker took it past him and ran at the dropping centre-backs. Feigning an early blast, the difference in knowing what 2. Bundesliga and 1. Bundesliga strikers will do was shown by the fact that both Augsburg centre-backs fell for the dummy. This gave Cissé time to carry on dribbling towards the D, nearer to goal, and most importantly, onto his favoured right foot. It may not have been the surest of connections, but Freiburg’s main man got enough on the ball to bury it into the bottom corner and hand his side a 1-0 lead! There was hope – and time – for the home side, however, and with the skillful Bellinghausen offering more presence and penetration down the left, an equalizer wasn’t long in coming. After winning a corner in the 52nd minute with a mazy dribble which gave his side bodies in the box and Freiburg pinned back, Bellinghausen was fed by Davids after the eventual set-piece was cleared. Admittedly having time and space to play with on the left wing, his eventual left-footed cross was perfect, and Mölders rose highest to head in for 1-1! But parity was restored for all of two minutes, as Freiburg again took the lead, this time with a less Augsburg-esque assist. Mensur Mujdža, a constant threat on the overlap, exchanged keepy-uppys with Caligiuri in the final-third, before burning down the byline with the space created thanks to some neat incision that a better opponent perhaps wouldn’t have fallen for. The Bosnian’s cross was perfect, and timing his run and leap between the centre-backs (who were relatively close to one another), Makiadi made it 2-1, capping a crazy opening nine minutes of the new half! Post-goal, Augsburg started attacking with their wingers even more than they already had been, looking to exploit the fact that Freiburg had now narrowed and were sitting deeper. The away side did, however, have three players primed to surge forward on the break: but with Augsburg keeping their centre-backs a cautious couple of yards behind the halfway line, Freiburg’s breaks never really had the kind of instant space needed to put the game to bed as early as they would have liked. As well as trying to prise Freiburg’s full-backs out of the now flat and narrow back four utilised by Sorg, Luhukay had encouraged his team to involve Callsen-Bracker and Davids a little more too. However, the pair always found Flum or Schuster keeping tabs on them, and even when they dropped a little deeper to pull Freiburg up the pitch, Sorg’s back four were alert and pushed up accordingly, ensuring that there wasn’t much of a corridor for someone like Baier to then cause havoc in. 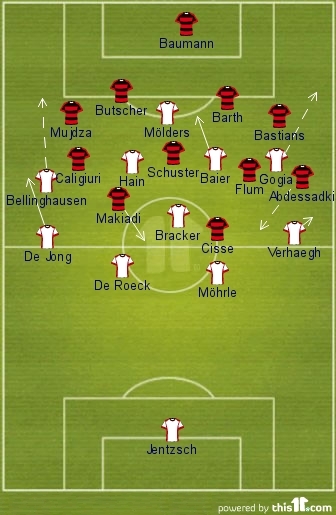 Augsburg’s Dutch coach made a like for like switch in the 70th minute, replacing the ineffectual Marcel Ndjeng with Akaki Gogia – perhaps hoping that he could inject as much life onto the right flank (where Verhaegh wasn’t offering much of an overlap) as Bellinghausen had on the left. But, it was still the latter player causing Freiburg most problems after the change, Bellinghausen’s fantastic control of the ball at pace and box of tricks causing Freiburg to use heavy-handed tactics in a bid to stop him. But it was a free-kick won by his colleague de Jong on the same flank in the 74th minute that so nearly saw Augsburg equalize, Baier at last putting in a decent delivery which Mölders headed onto the post after a brilliant mid-air pirouette. The hosts now had the bit between their teeth, so it was no surprise when Makiadi went down after being out-muscled on the break, causing a delay in play that lasted two minutes. Although Davids had begun to show more enterprise in getting on and using the ball, Luhukay had deemed the time right to change to a permanent 4-1-4-1. Thus, Stephan Hain took his place, giving Augsburg more bodies further up the pitch at a point in the game where Freiburg were settling for a 2-1 win. And in the 81st minute, the switch paid off. Augsburg now had more passing options on the edge of the box, allowing them to keep Freiburg chasing shadows before switching play to Gogia on the right. The young winger’s cross was perfect, and helped by some Mujdža ball-watching, Mölders again demonstrated just what a brilliant player he is in the air by leaping to send a bullet header flying past Baumann. 2-2, with nine minutes to play! After looking for all the world like they were going to take three points from Bavaria, Freiburg weren’t now willing to settle for a draw. So, Sorg introduced Garra Dembélé and Anton Putsila, and deployed a 4-4-2; Flum moving out onto the right. It was a wise choice, and so nearly won Freiburg the game, when Dembélé, whose power and enthusiasm proved a welcomed tonic for a Freiburg defence under the kosh, broke into the box in the 91st minute, resisted the urge to go down after Jonas De Roeck tugged his shirt, and forced Jentzsch into yet another near post save. That was that, and a game which really was one of two halves finished 2-2. This entry was posted in 1. Bundesliga, Augsburg, Freiburg and tagged Akaki Gogia, Cedric Makiadi, Daniel Baier, Garra Dembélé, Heiko Butscher, Jan-Ingwer Callsen-Bracker, Lorenzo Davids, Marcel Ndjeng, Mensur Mujdža, Papiss Cisse, Sascha Mölders, Simon Jentzsch, Tobias Werner, Uwe Möhrle, Yacine Abdessadki. Bookmark the permalink.